Banana pudding is a delicious and surprisingly portable treat you can easily tote across campus on game day. When I was strolling through Walmart the other day or should I say pushing my cart mad fast down each aisle to complete my monthly trip ASAP-- I had not even fully pulled into a parking spot and was already ticked. Any-hoo, I came across these Rubbermaid containers with crimson lids: Takealongs-- Perfect! Available in several sizes and uber affordable-- the 13-ish x 9-ish size was $2. 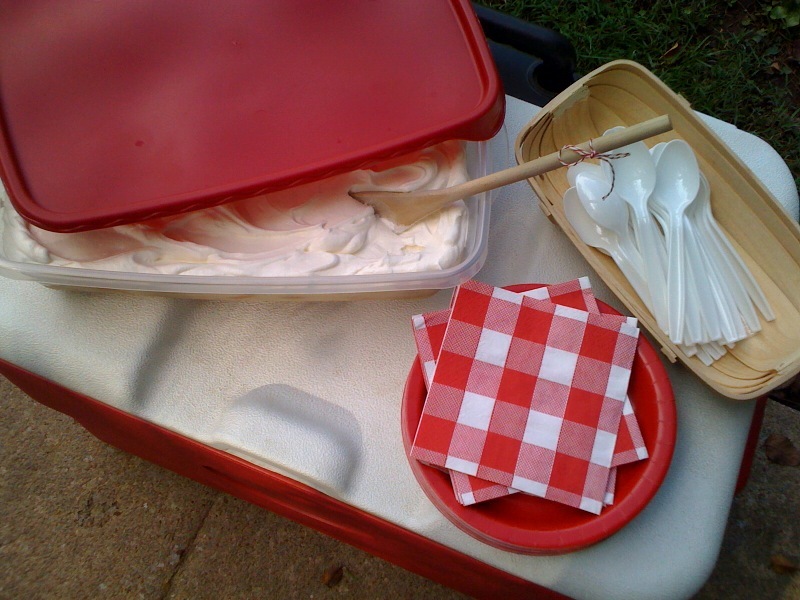 With this smart find, simply fill your cooler per usual, pop the crowd-pleasing dessert on top, close the lid, then wheel away to your spot. This version happened to be inspired by two of the very best banana pudding-esk numbers I've ever had. You should really give all three a try. You won't be disappointed. One component I knew I really wanted in my version was this to-die-for vanilla wafer crust from Banana Pudding Pie that originally ran on the Southern Living cover in February 2007: http://find.myrecipes.com/recipes/recipefinder.dyn?action=displayRecipe&recipe_id=1578375, but since there wouldn't be any baking allowed in my plastic dish, I opted to freeze the crust instead and add a touch of salt to really make everything sing. Secondly, I'm a whipped cream fan instead of a meringue fan, but I also knew the meringue wasn't an option anyway, again because of the plastic container. I took a peak at Nutter Butter Banana Pudding Trifle that originally ran on the Southern Living cover in February 2009: http://find.myrecipes.com/recipes/recipefinder.dynaction=displayRecipe&recipe_id=1873387. Although this one is truly delicious, Marrow was craving a straight up banana pudding sans the peanut butter cookies. However, the vanilla pudding looked like a good starting point. Prep: 20 min., Cook: 15 min., Chill: 4 hrs. Game Plan: Prepare Thursday or Friday evening, start to finish. The pudding will be cool enough to go ahead and add the whipped cream and should hold up fine until serving on Saturday. The banana flavor will only get better if allowed to chill out until then. Note: This pudding is on the looser side and will thicken as it cools. If you prefer a firmer texture, bump up the flour from 1/3 cup to 1/2 cup. Reserve 28 vanilla wafers and set aside. Crush remaining wafers in a zip-top plastic bag with a rolling pin (I like them a little chunky). Combine with butter and salt. Press mixture into a 13 x 9-inch (give or take an inch) dish/pan/container or whatever you'd like to use. Freeze while you prepare the pudding. 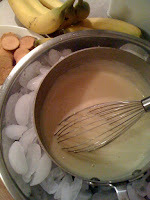 Whisk together 3/4 cup + 2 Tbsp. sugar, flour, and eggs in a 3 qt. saucepan; whisk in milk. Cook mixture, whisking constantly, over medium-low heat 15 to 20 minutes or until thickened-- make sure there's a slow bubble before you pull it from the heat (Mixture will not be pudding consistency at this point, but will continue to thicken as it cools). Remove from heat. Whisk in vanilla. Place saucepan in a large bowl filled with ice, stirring occasionally, for 30 minutes or until well chilled. (Add additional ice to the bowl, if necessary, as some will melt right off the bat.) See photo left. 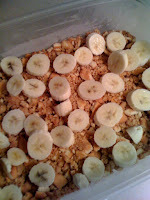 Slice 2 bananas over frozen wafer crust, pour half of chilled pudding over bananas, and top with reserved vanilla wafers. Repeat with remaining bananas and pudding. Whip cream and 1/3 cup sugar until soft peaks form with an electric mixer. Spread cream over pudding layer. Chill at least 4 hours or up to 2 days. The Extra Point: Mix it up and add some crushed pretzels to the crust and the layers or try with your favorite cookie. Graham crackers, chocolate wafers, or gingersnaps would be delicious substitutions. You could even add some sweetened flaked coconut to the pudding, if you choose.